I really wanted to go to Paraguay just to see what was there. It is very under-developed in terms of tourism and yet has great swathes of jungle and wetlands that I'm sure will one day be on the tourist trail. We limited ourselves to a couple of days in Asunción, the capital and a brief tour around the area to see lots of old churches. We left Asunción by coach to reach the Brazilian border and found ourselves in a fantastic coach equipped with business class style seats that became nearly flat beds. Shame it was only a 5 hour daylight run to Ciudad del Este. 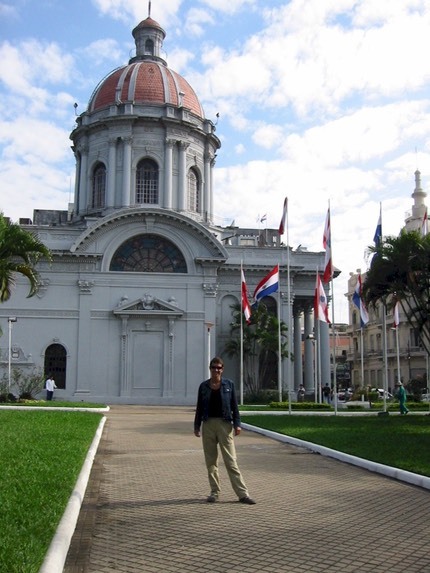 This is Jonna outside the Pantheon where Paraguay's heroes are laid to rest (!). Asuncion has heaps of banks and everyone drives Mercedes, but its hard to see where the money comes from. We found it surprisingly expensive, especially having come from Bolivia where you really can live on a few dollars a day. We visited a chrch in Paraguay that had been honoured by a visit from the Pope. 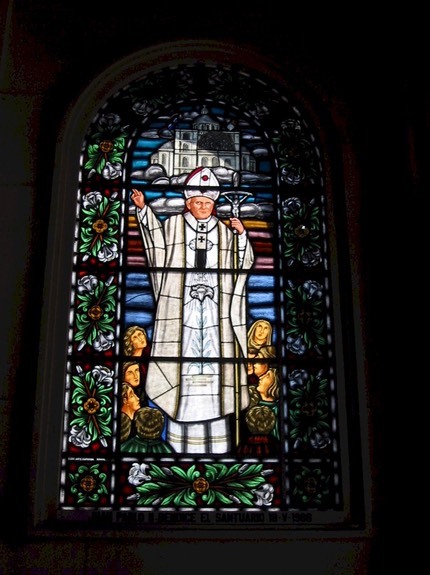 To celebrate this momentous event they had a stained glass window made. How cool is this?